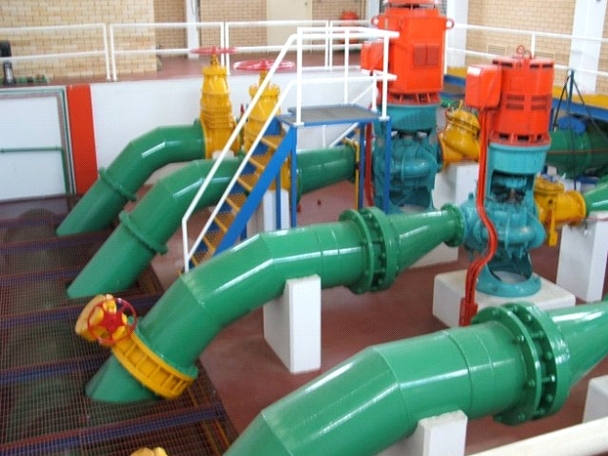 A topic of continual concern for today’s water utility is Pumping Station Energy Efficiency. And to put this subject in laymen’s terms, how better than to relate it to fuel efficiency for the familiar automobile? First, let’s look at the work that each produces — With a car, the unit of work is expressed as a driven “Mile”; whereas in a pumping station, the unit of worked is expressed as a pumped “Gallon” of water. Next, let’s look at their respective energy sources — The unit of energy for a car is a “gallon of gasoline”, whereas the energy unit for an electric pump is a “Kilowatt-Hour (KWH)”. At the time of this writing, a gallon of gasoline is around $2.00, and a Kilowatt-Hour is around $0.12. When shopping for a car, one seeks the vehicle that offers the highest work/energy ratio — expressed in the familiar MPG, or miles per gallon of gasoline. 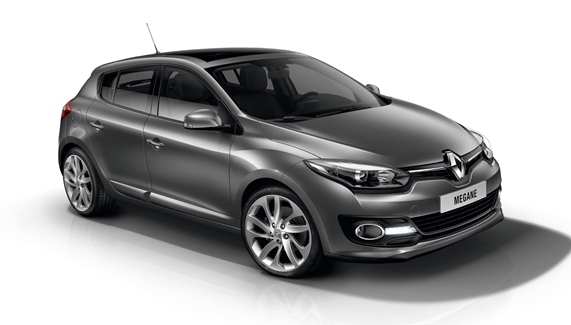 After purchase, the driver can control the speed of the vehicle so as to maximize the MPG. We know that a car achieves its highest MPG at moderate speeds, and worst MPG at high and low speeds. And as drivers, don’t we balance our desire to complete our trip in a short time against our desire to achieve the highest possible MPG? These principles apply to pumping stations, as well. Here, we also wish to complete the work quickly — for example: fill a water tower — but we also wish to minimize energy costs. As with a car, we often discover that moderating the pump speeds can lead to lower energy costs. Before energy optimization can be attempted, we first need a method of quantifying the energy efficiency of our pumping system. In the automobile example, we use the work/energy ratio — MPG. In our pumping system, we propose to use the work/energy ratio of gallons of pumped water per kilowatt-hour — I propose we call it “GPK”. For a car, it’s often just called “mileage” for short… So for our pump station, let’s just call it “gallonage”. To help the driver monitor and maximize fuel efficiency, certain automobiles even display the current MPG on the console. 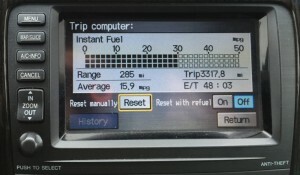 To provide this reading, an internal computer divides the speed (miles per hour) by the metered fuel consumption rate (gallons of gasoline per hour) to provide “miles per gallon”. For example, if a car is traveling 60 miles per hour, and its fuel consumption rate is 3 gallons per hour, then its computer calculates the “mileage” to be 60/3 or 20 miles per gallon. Automobile Trip Computer: Fuel Efficiency Display. 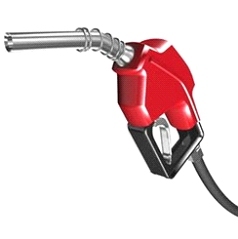 Knowing the cost of a gallon of gasoline, we can put this in terms of dollars — 20 (miles per gallon) / 2.00 (dollars per gal) = 10 miles per dollar. 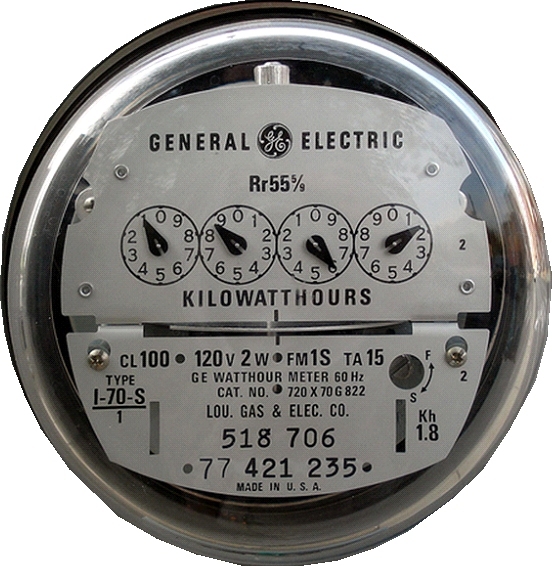 In a pumping system, the “gallonage” (gallons/kilowatt-hour) is calculated by dividing the pump flow rate (gallons per hour) by the energy consumption rate (kilowatt-hours/hour—same as kilowatts). For example, if a pump’s flow rate is 30,000 gallons per hour, and the energy consumption is 20 Kilowatts, then the “gallonage” is 30,000/20 or 1500 GPK. Knowing the cost of a Kilowatt-Hour, we can also put this in terms of dollars — 1500 GPK / 0.12 (dollars per KWH) = 12,500 pumped gallons per dollar. Much like an automobile that displays MPG on the console, Navionics Research can now display GPK within the telemetry/SCADA interface. As a result of the installation of VFD’s (Variable-Frequency Drives) and setpoint tuning guided by NRI’s new VFD & Energy Analytics Package, we are pleased to report that a client was recently able to increase the work/energy ratio at one of its pump stations by a factor of 3.03! That is equivalent to increasing the gas mileage of an automobile from 20 GPM to over 60 GPM! Most importantly, this translated into a reduction of the average monthly cost of pump energy at this pump station from $345/month to less than $114/month — providing the customer over $2776 per year in electricity savings! Are you interested to know more about the VFD’s, telemetry equipment, and software used on this project? — and how it was leveraged to accomplish this feat?